Do you want to become a lawyer? Or you want to own a law degree from a reputed college, Bangalore? Then search for the college which offers essential skills like research, critical analysis, and fusion of critical ideas. These skills play an important role in the life of a lawyer. If you’re seeking direct admission in M. S. Ramaiah College of Law, Bangalore through management quota, then, of course, you’re at the best place. So, be the one to get the first seat in the reputed institute of Bangalore for the law course. The esteemed M. S. Ramaiah College of Law was recognized in 1995 with the consent of Bar Council of India. 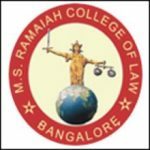 The M. S. Ramaiah College of Law, Bangalore has been accepted as a training and nursery land for those students who want to pursue their career in this legal profession. The M.S. Ramaiah College of Law, Bangalore is basically established to cater to fulfill the demanding needs of students who are desirous in seeking legal education. It is affiliated with Karnataka State Law University, Hubli. The goal of M. S. Ramaiah College of Law is to help the youngsters to improve their knowledge, nurturing love and right attitudes in them for learning, and state-of-the-art knowledge about obligations and legal rights. MS Ramaiah College of Law is a co-educational college located in MSR Nagar, MSRIT Campus, MSRIT Post Bangalore. Direct admission in M. S. Ramaiah College of Law, Bangalore is a good opportunity for your brighter career and future. In M. S. Ramaiah College of Law knowledge is also provided through guest lectures from former judges of Supreme Court and High Court and reputed advocates at regular intervals of time. Why Take Direct Admission In MS Ramaiah College Of Law, Bangalore? Merit Holders: The M. S. Ramaiah College of Law has been constantly producing Merit holders from its beginning. The majority of the scholars/students have gone through the passageways of this esteemed college to become a legal luminary. Education: Our education is being evolved continuously to teach the law of comprehensive knowledge to our students. We train our students in legal practices by ensuring qualitative excellence in education. Flexible learning environment: College offers an inexhaustible and rich source of learning like guest lectures by renowned legal experts, controversial court practices, court visits, debates, presentations, seminars and et cetera. Activities: S. Ramaiah College of Law, Bangalore conducts cultural activities and fest every year. Seminars, workshops, teacher’s day and sports day are led by the students. M. S. Ramaiah college students are extremely dynamic. The college supports students club to furnish their skills and knowledge. The majority of our students have won different medals and honors in college competitions. Placement: The majority of our students are selected from M. S. Ramaiah College of Law, Bangalore by means of campus selection. The progress of our college can be judged by the quality of our students. Year by year the graph of our students regarding placement is rising. For more details on direct admission in M. S. Ramaiah College of Law, Bangalore, feel free to contact us and we will help you out in admission procedure.